My daughter, Grace, is now five years old and ready to ride a horse by herself. 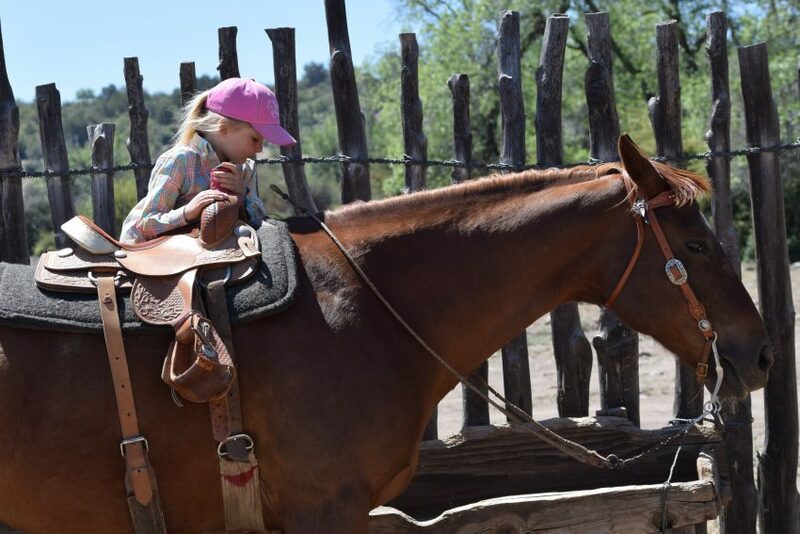 According to her, she’s been ready to ride a horse by herself for about four and a half years now, but she had to wait for Mom to be ready before she could take the reins and ride off by herself. Ever the bossy big sister, she has already developed her own system. When you’re short and want to ride a full-size horse, the first step is to throw your halter around his neck and run the lead rope through it. Thusly captured, your horse can then be led out of the corral and up to the hitching rail. “Teaks” is a good old boy. He is now 12 years old, and my husband started him when he was 3. I rode Teaks when Jim and I dated, and now he is the kids’ main mount. Because if you’re not stealing horses, you’re clearly not a cowboy’s wife or child. 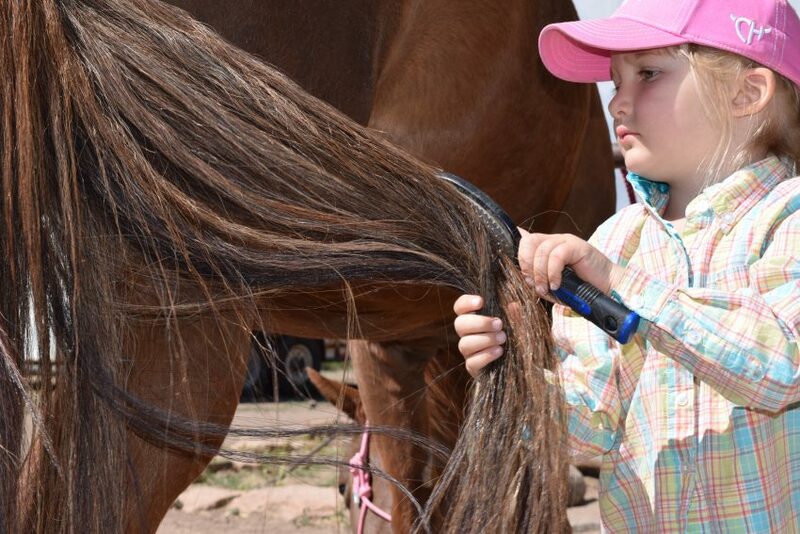 After your mother has properly haltered your horse, the next step is thoroughly brush his tail. This task is very important and worthy of a small child’s full attention, as demonstrated by Grace’s facial expression. After your gentle gelding is brushed, saddled and bridled, lead him to the gate and reach up to untie the rope holding it shut. Don’t worry about your horse; he is a seasoned pro and will wait patiently while you figure out how to undo the complicated square knot. 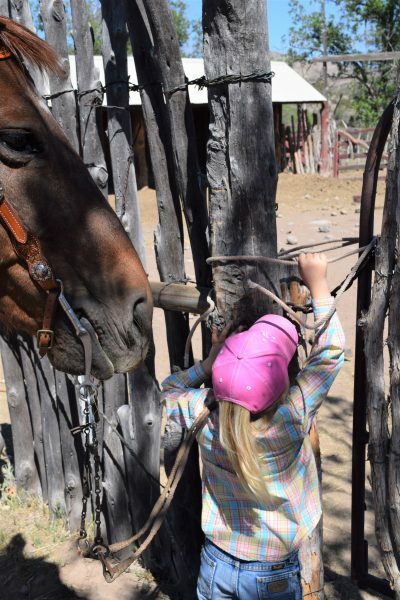 Once your cinch is tight and your hat pulled down, there’s nothing left to do but climb aboard and ride away to explore the horse pasture. 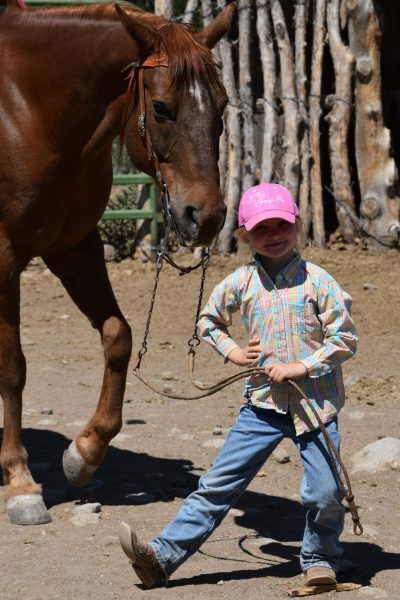 There’s a barrel pattern to practice, a creek to cross, a fence line to check, a little brother to let take a turn in the saddle, and a big hill that she really wants to climb all by herself, but her mother won’t let her. After your morning adventures are completed, it’s time to ride over to the wooden grain manger and dismount. The ability to get on and off your horse independently is very important to the self-esteem of a small child, so resourceful mounting blocks are a pretty big deal. They’ll make you go “Ta-da!” for the camera. Side note: The ability to get on and off your horse by yourself is a big deal, but the ability to correctly button your shirt is not. 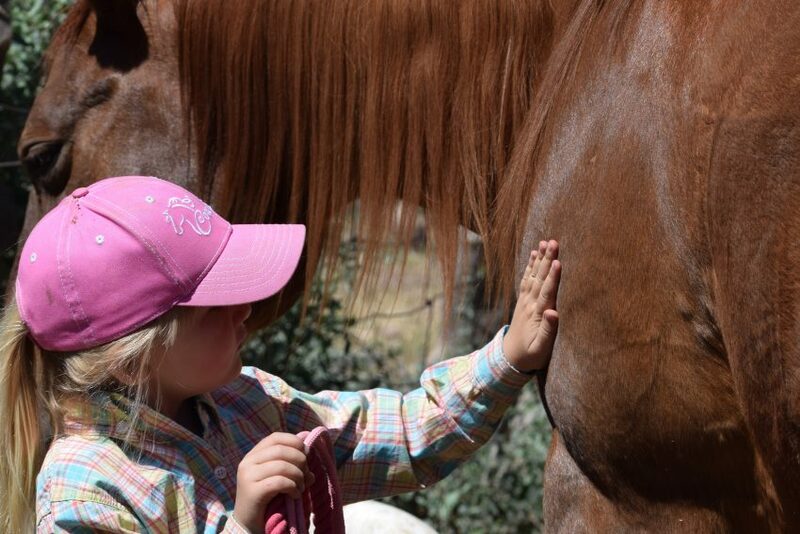 After your horse is returned to his corral, always give him a good-bye pat on the shoulder. Horses like sentiments like that. Plus, it gives you one more chance to smell his mane, which is reminiscent of heaven mixed with sweat. 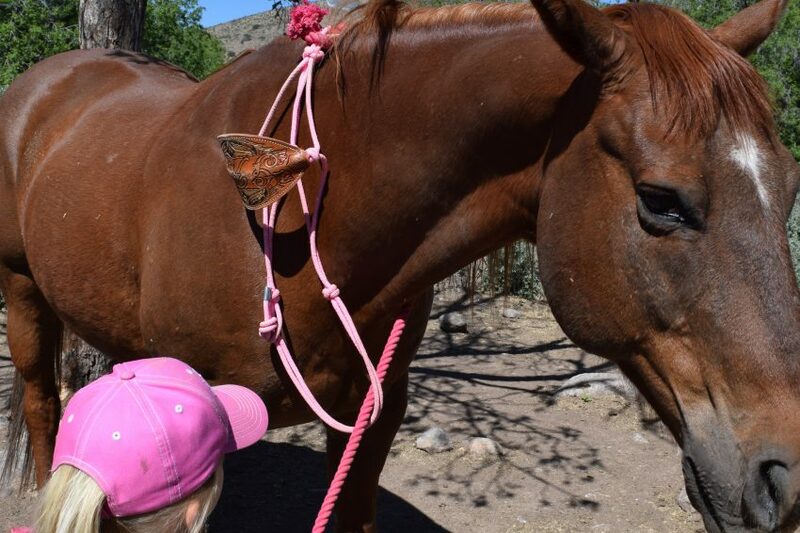 The best part of teaching my daughter to ride her horse is remembering my own childhood spent horseback. 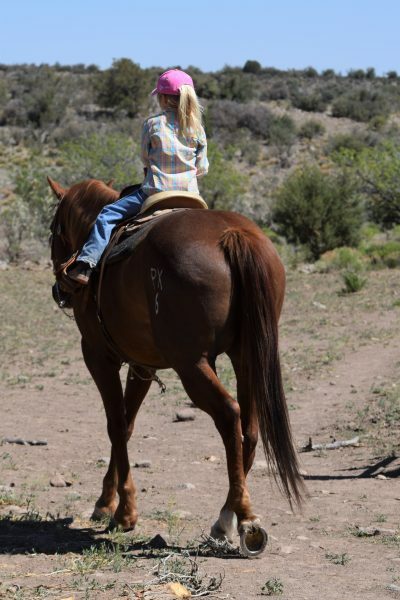 I’m grateful for the good memories that growing up in the saddle will give her for the rest of her life.